Ask fellow campers about "Pioneer Park Campground" and nearby attractions. Nice campground, stayed here off season during the extreme flooding taking place all along the east coast but it appears to be well kept, sites are large and spaced nicely. Will definetly stay here again. We camped at Pioneer Park Campground in a Motorhome. No way this park deserves the current 7.9 rating - my opinion, the only way it gets it is because it has lots of activities. When you first pull in everything looks great, but then you get to your site... Interior roads are narrow and a mix of old asphalt, crushed stone and mud. The site itself was very small, a tree so close we can't use an awning, covered in cigarette butts, fire pit full of trash, wi-fi non-existant. We asked for a site near the bathhouse, and we weren't too far away, but what's the point when it's closed down - they didn't bother to tell us that when we checked in. It rained a lot while we were there (no fault of the campground) and several of the sites were extremely muddy, including ours and the one next to us. That didn't stop them from trying to squeeze someone in though - you'd think they'd get the hint when the second person asked for a different site because of the mud, but no, they kept sending folks over, even though there were several other sites available. We will not be back... We camped at Pioneer Park Campground in a Fifth Wheel. I cannot say anything good about my stay here. At check-in, the person checking me in treated me like she was doing me a favor. When the reservation was made, we wanted a site near the restrooms, which we got, but the restrooms were closed. Our campsite was littered with cigarette butts and the firepit contained trash. Never say never? If I'm ever in this area again I will look elsewhere. We camped at Pioneer Park Campground in a Fifth Wheel. Very nice family campground. lots of children activities, bikes and children having fun. Many seasonal campers. Trash pickup timely and park was keep clean. Our only issue was drain for sewer was very high off the ground which made it difficult to drain the tanks. We camped at Pioneer Park Campground in a Fifth Wheel. The area has more to offer then i believed, i.e. flight 93, Frank Lloyd Wright house "falling water" and the Mr. Rogers exhibit. Very pretty area, but PA roads are something not to look forward to. Nice campground with lots of activities. Fishing, swimming, mini golf, paddle boats, kayaking. You have to use theirs but rates are very cheap. Children activities on weekends and live band Saturday night. Mostly seasonal or long term campers. Very welcoming long term campers were very friendly, even invited us over for mountain pies and s'mores. Strict policy of no bikes after 8 PM. They even ride around to remind you just before. No golf carts buzzing around. We were forewarned by a long term camper that there is little water pressure on weekends so I filled our tank and used that when pressure was low. Our power pedestal breaker tripped 3 times while not overloaded so may need serviced. My wife said the restrooms were the cleanest she's seen in a campground. May just be our new favorite campground within an hour so drive from our home. We camped at Pioneer Park Campground in a Travel Trailer. 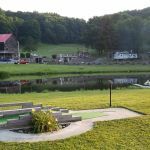 A nice, relaxing campground with plenty of activities such as fishing, swimming pool, tennis, basketball and mini golf. Three rows of RV storage. Employees will move the RV to a campsite on request. Hookups were good and easily accessible. Cable TV good. WiFi nonexistent at our campsite. We camped at Pioneer Park Campground in a Motorhome. Somerset is about 6 miles away. We stayed here to visit the Flight 93 Memorial which is about 40 minutes away. We had a nice site, the park was very quiet. It was late in the season so we had most of the park to ourselves. We camped at Pioneer Park Campground in a Travel Trailer. Nice campground with no significant issues. There were some things that you should be aware... As others have mentioned, the entrance to the park is enough out-of-level that my fifth wheel rubbed the truck bed a little. My particular space was a pull through and was also at an angle. Auto-levelers were able to handle it, but it was close. Septic connection was a the "top" of the lot and it caused issue when trying to dump. Had to back-up and block the road a little to get the RV tanks above the septic line. Uploaded flyover video took with a drone... https://youtu.be/c2PHC8hDYtI. We camped at Pioneer Park Campground in a Fifth Wheel. We came to this park during the last week they were open for the season, actually we left the day they closed. Everything was pretty much closed down but we rarely use these services anyway so we were not affected. Our site was way in the back and very quiet but no one else was around us. The area around the site was very large and completly covered in grass, a really nice setting. The only problem we had was trying to get the camper entirely on the gravel, it was kind of narrow but still a nice site. We did have a problem with the cable hookup but it was fixed by maintenance within 15 minutes. Great service. You could see that a vast majority of the sites are full timers because of all the decks and other fixtures around the campers plus the camper storage area was packed. We would surely stay again. We camped at Pioneer Park Campground in a Fifth Wheel. We stayed here because of the 3 National Parks in the area, but the Flight 93 NM was by far the best to visit. We stayed here twice in 2016. I believe our sites were 106 and 13. 106 is way in the back of the campground and 13 is near the pool. Both site were on a slight grade. 106 was a bit trickier to set up on. There is plenty to do on site and in the area. Laurel Hill State Park is a short drive as is Somerset PA. At the campground, the hiking trails are hilly, but secluded so a nice place to walk my dogs as was the rest of the campground. Mini-golf was nice as was the pool. And they have a nice fenced in off leash dog area. You have to buy a permit daily to fish in the ponds. I think it was $7 and you are not allowed to fish past 8 PM so that was a negative. We camped at Pioneer Park Campground in a Travel Trailer. On Saturdays, there are a few local produce stands and a farmers market in Somerset. We ate a diner in Somerset that had excellent food. Be sure to check out the discount store in Somerset also. There is also an RV dealer not far from the campground should you need something. If you like to hike, Laurel Hill State Park is close by and has all sorts of paths. The site was very easy to access and was large enough for our 40' RV pulling a 16' bike trailer. Nice grassy area between campers with some shade trees. If you like to fish, they have 3 ponds for that plus paddle boats to rent. It was very clean and lots of staff on hand if you needed anything. The wifi was pretty scketchy though. We camped at Pioneer Park Campground in a Motorhome. Flight 93 Memorial is not far away and worth the trip. We love this park, but let me "for-warn" you - come on a week day! Seems that this is a major summer vacation stay for the locals! What they seem to do is park their 5th wheels here from June thru Labor Day/Oct. then just come and use them over the weekends! From Mon-Thur it's as quiet as can be, your practically the only one around... then slowly starting on Thur people start showing up, and by Fri night, almost every space around here is jam packed (even the empty ones, all the tent spaces, everything, and this place is jumping! Wow! Kids, fires, people visiting people, it's a hoot! We couldn't get over the change! It's not loud, just lively. Then come Sunday afternoon, and people start slowly packing up again, and by Monday, dead again. Amazing. The area over by the pool, are "full-timers" who are here all the time, but across the ponds, are the "rest of us". The place is lovely. Good WiFi (secure), good cable, close to town and forests, just a great place to be. Only a half hour, maybe 40 min. to Pittsburgh. We camped at Pioneer Park Campground in a Motorhome. Close to Somerset as well as only 40 min. to Pittsburgh, so lots to see and do in the area! Great camping in the Laurel Mountains. Big sites, big fire rings, Two big lakes, pool and very family friendly. Clean and nice pull through sites. Really enjoy Pioneer Park about 3 - 6 times every season. We camped at Pioneer Park Campground in a Motorhome. Very pretty setting spoiled by a poor experience from start to finish. Young office staff gave poor directions to park, recent rains made for a muddy mess (up to a foot deep in some parts of park), very narrow sites, shut off our water without notice, bath house not clean (dead bugs and leaking urinal), pricey given that no amenities were open / available. Not sure this park should be rated as big rig accessible as, like the prior poster, our larger fifth wheel dropped onto our truck's bed rails due to the angle of the road and campground entrance. We would not return. We camped at Pioneer Park Campground in a Fifth Wheel. Fairly level gravel pull through surrounded by very muddy grass. Good power,water and cable. Useless Wi-Fi. Smashed a large gouge in the bottom of our fifth wheel overhang and a large dent in the truck on the turn and hill at the entrance. Will not stay here again. We camped at Pioneer Park Campground in a Fifth Wheel. Are you affiliated with Pioneer Park Campground ?